I was diagnosed with MBC in Nov 2011 (first diagnosis: mets to liver, bones, lung & brain), and have been feeling very well for years on Herceptin. However, this month, there has been new growth in the breast & supraclavicular lymph nodes - so there is some cancer that has become resistant to Herceptin. I would like to begin Perjeta (pertuzumab), but this is currently only financed on the PBS as a first line treatment. I'm ineligible as I've already had a HER2 targeted therapy... even though Perjeta wasn't available back when I was diagnosed (insert frustrated eye roll)!!! Appreciate any suggestions or stories of successful access for those of us with HER2+ MBC diagnosis prior to Perjeta coming on the market. Hi @KeelyB Whilst I'm not in your position I cannot believe the idiocracy of this. Perhaps your oncologist can contact the drug company directly and request they consider you a special circumstance. I know they have done this for others requiring treatment for Estrogen cancers. It's worth asking if they could consider this since perjeta wasn't available when you first started treatment . I guess they may offer to test and see if improvement is noticed with the addition. The cost is out of most people's reach otherwise. Hope they will try for you. Your bc nurse might be able to help push this for you. Also..will they re-biopsy these areas to ensure no pathology change? ..I believe sometimes cancers can do this and therefore require a new plan of attack. We did a biopsy and the pathology is still HER2+, so no change there meaning it's become resistant to Herceptin. We are trying to find the contact at Roche to write to and explain the situation... fingers crossed we get a compassionate response! The existing company access programs don't appear to apply to my situation. Appreciate your message, thank you. Oh my this is just so not right. @primek has some good suggestions and hopefully @bcna can advocate for listing on the PBS. I'm hoping you receive a compassionate response from Roche. [email protected] just to let you know we at BCNA are looking into this also and will let you know how we go asap. It is great to know we have this amazing network behind us! Keely, I am in a similar situation in that i have been treated with Herceptin alone for over 5 years. It is still working for me, but I have ben told I won't be able to add Perjeta. However I understand it is the combination of Herceptin and Perjeta that is proving (slightly) better in trials. If herceptin has stopped working, which seems to happen to many eventually, Perjeta alone wouldn't be enough. The next option for Her2 women is Kadcyla, now on the PBS. That said, good luck with contacting Roche. It might be an idea to search for trial results in regard to adding Perjeta after Herceptin fails. Yes, Kadcyla is an option, but I'm being told by oncologists that Perjeta + Herceptin + Taxol would be the best option. My children are still only 7 & 9 years old, so I'm quite honestly looking for maximum extension of my life with minimal side effects so we can all get on with life. Ordering these available treatments in the most effective order is my priority to maximise longevity... We are considering surgery too, in case that will also get me extra time before starting a new systemic therapy, as Herceptin is currently keeping bones, liver & lungs under control, while I have growth in the supraclavicular lymph nodes only (per the latest PET scan). There are options, just trying to wade through the research and advice for the "best" option given my treatment goals. Best wishes to you for your ongoing treatment!! I just wanted to update you that it looks like Roche have agreed in principle to include me in an access program where they pay every third Perjeta treatment. (My oncologist contacted them directly). Obviously this is still very expensive and won't be sustainable long term, but we are thinking we will try to self fund for a few months to see if it's working and hopefully in the mean time it will be considered for funding as a second or subsequent line of therapy for Stage IV HER2+, or I'll have some evidence to push my case. I will let you know how it goes, as I have to sign some paperwork tomorrow morning. This is Kathy from BCNA's Policy Team. I am sorry to hear about your situation Keely. I want to explain why Perjeta is only listed on the PBS as a first line treatment. The Pharmaceutical Benefits Advisory Committee (PBAC), which is the committee the makes recommendations to the government about which drugs should be added to the PBS, considers a number of different factors when making its decisions. One of these is the efficacy (effectiveness) of a new drug and whether it is better than the current standard treatment. The PBAC evaluates findings from clinical trials to make this decision. The original clinical trials for Perjeta trialled it as a first line treatment only, so the evidence to support its use when the PBAC made its decision was in the first line setting only. To have it listed on the PBS as a later line treatment, clinical trials would need to show that it is better than other available treatments and Roche would need to make a new application to PBAC. If you are still considering whether to pay for Perjeta, you might like to ask your medical oncologist why he/she thinks it is better for you than other treatments that are available through the PBS (such as Kadcyla) and how superior it would be to other treatments. You could also ask how long he/she thinks you might be on it - this would help you to work out what it might cost you. Please feel free to call our Helpline and talk to one of the nurses if you think it would help you to talk through this decision with someone. Thanks very much Kathy and sorry for my long delay in responding. My oncologists think Perjeta would likely be the most effective next treatment, as I've been an "exceptional responder" on Herceptin, but also have a lesser detrimental impact to quality of life over Kadcyla. I have gone back to uni and this will be my last year of my Masters, so I really just want to get that finished so I can get back to work! I understand there are no clinical trials of Perjeta as a second line of treatment in the pipeline at the moment, so we've decided to pay for Perjeta for 3 months and see if it works, then go from there. Roche have agreed to pay every 3rd treatment, which means we pay $3200 every three weeks, twice, then just a compounding fee for the third cycle treatment. I've had the loading dose three weeks ago (taxol + herceptin + perjeta), and will have my second cycle tomorrow. As my new growth is in my supraclavicular lymph nodes, we can actually feel that it's having an effect already! I thought I would check in to see how you are going with the Perjeta + Herceptin + Taxol. I hope you are doing well. My Mum is in a similar boat, she has been on Herceptin since 2012 which has been working to keep it at bay but we have just found out she has a tumor attached to her rib. Devastating news. I feel for you & your Mum and apologise for taking so long to reply. I am stable again, per my latest scans about 10 days ago. We've paid for four cycles now ($12,600 + compounding fees for the two "free" doses I've had from Roche through their compassionate access program, where I get every third dose free). It's proving very stressful to be honest, watching our mortgage grow again. And because I'm getting Taxol with the Perjeta & Herceptin, I'm not feeling super either. My goal in paying for Perjeta was to hopefully feel as good as I did when just on Herceptin... it hasn't come to fruition yet :> I have asked my Onc how long I'll be on Taxol, but she hasn't given a target number of cycles. I will soon need to decide if I can afford to wait for the quality of life benefits of Perjeta & Herceptin without a cytotoxic agent. I honestly hope BCNA is advocating to have Perjeta available as a subsequent line of treatment, just as they plan to for the newly approved Ibrance. 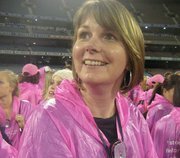 Now I know Perjeta is working, I plan to make an appointment with my Federal MP to explain it's the hope offered by new treatments coming in the pipeline that enables MBC patients and families to look toward the future & get through the tough days. If these new treatments are inaccessible to existing MBC patients, it takes away that important hope. And the total cost to the PBS is similar as if I'd gone onto TDM-1 anyway! My best wishes for your Mum and the decisions ahead, I'm sorry my answer is not definitive either way. It's been a year since I started self-funding Perjeta (I did 9 rounds of Taxol + Perjeta + Herceptin, now just on H+P). I feel great again, my scans are stable (no sign of the new growth from last year) and bloods are normal. However, I'm still self-funding under Roche's "Compassionate" Access program where they pay every third dose. My frustration is I've paid for a year now to prove that Perjeta is working for me as a second line of treatment. My quality of life is excellent, but the financial strain is huge. Is there any progress in getting Perjeta approved as a subsequent line of treatment for MBC? My understanding is Roche haven't applied to TGA or PBAC for approval as a subsequent line of treatment? Has anyone heard of any trials for Perjeta as a second line of treatment? Is BCNA planning any further advocacy for patients in my situation?